After theend ofthe 20th century, the science ofcrystallizationreached a truly exciting stage where new opportunities emerged in both theory and expe- ment. Variousphysical methodsare capableofresolvingthesurface as wellas theinsidestructureofcrystalsattheatomiclevelwhilenewhigh-performance computingresourcesaffordthecapabilityofmodelingthecomplexlarge-scale alignmentsnecessarytosimulatecrystallizationinrealsystems.Asaresult,the science of crystallization has shifted gradually fromstatic to dynamic science and considerable progress now underlies the complex but beautiful cryst- lization process. I believe that if a de?nitive history of 21st century science is ever written,one of the highlightswill be the science ofcrystallization. This science has the following characteristics: in?nite advances in soph- tication, unlimited opportunities not only for intellectual excitement but also forindustrialmerit,strongcollaborationwithbiologyandmaterialscience,as wellaswithallareasofchemistry.Thevastpotentialofcrystallizationasan- portant?eld ofscience isfar beyondthesimple technologyofpharmaceutical industries during the 20th century. Optical resolution was one small area of chemistry in the last century. This was more a technology than a science, largely because trial and error was the only method to obtain good results. However, the situation is now changing. Therearesomanyappealing,hidden?ndingsintheprocessofcrystallization. Historically, crystallization began in an old laboratory in academia and then gradually shifted to industry. Now,it is making itscomeback in academia due toseveralnewresearchbranchestryingtodiscoverwhatisgoingonduringthe crystallizationprocess.Ibelieve this?eld ofscience isnowgrowingasa result of the wonderfulcoupling between industry and academia. 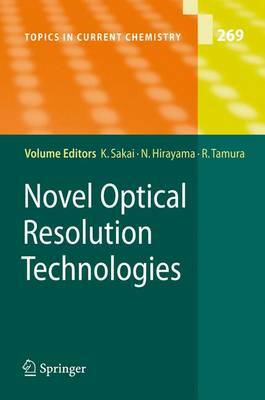 I read a prepublication draft of Novel Optical Resolution Technologies,and foundthateachoneofthesegeneralcharacteristicsofsciencehadarealityand sharpness that I had not expected. While it was a sheer delight to revisit each of these triumphs guided by the wise insights and analyses found throughout the book. There is a good balance between the underlying historical material and the design and execution aspects of each topic.